ARLINGTON, Va. — On the 50th anniversary of the death of Robert F. Kennedy, hundreds — including former president Bill Clinton, Kennedy family members and members of Congress — gathered to commemorate the remarkable life of the junior U.S. senator from New York. Arlington National Cemetery served as the backdrop for Wednesday's memorial service to remember RFK, the younger brother of President of John F. Kennedy and once presidential hopeful who was assassinated in a Los Angeles hotel on June 6, 1968. The ceremony included speakers reading RFK's own words and a performance from country star Kenny Chesney. The 42nd president talked about the "deepening division of America in 1968, a time of hope, heartbreak and division” during his last semester of college, in a country plagued by the death of Martin Luther King. Jr., divided over civil rights. He continued: "So I ask you as he would, if he were 92 standing here, he would be saying you can do better, we can and we must. His legacy has brought us here and will see us forward." Clinton later tweeted about the event. Kathleen Kennedy Townsend, RFK's eldest daughter, thanked Clinton for speaking at the event. Recalling growing up in the room next to her father, Townsend said the late Kennedy listened to Shakespeare every morning while doing pushups. Nearly 20 speakers paid tribute to RFK by reading several of his famous words aloud. Rep. John Lewis quoted RFK from his address about the assassination of Martin Luther King, Jr. in Indianapolis on April 4, 1968, given months before his own death. Rep. Joe Kennedy III, born 12 years after his grandfather's death, also paid homage to RFK. 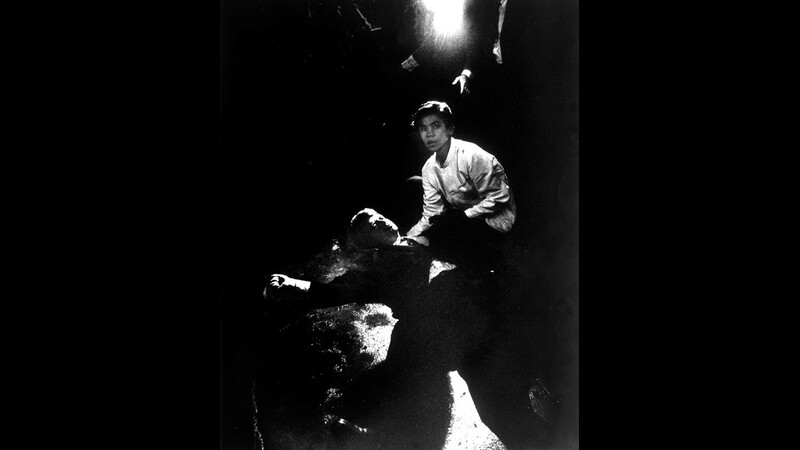 Senator Robert F. Kennedy lies on the floor of the Ambassador hotel kitchen in Los Angeles semi-conscious in his own blood moments after being shot while busboy Juan Romero tries to comfort him on June 5, 1968. Robert F. Kennedy was rushed to a hospital for treatment and died 26 hours later at 1:44 a.m., June 6, 1968. Friends and family of Sen. Robert F. Kennedy will host a memorial service at Arlington National Cemetery on June 6, 2018, to honor him on the 50th anniversary of his assassination. 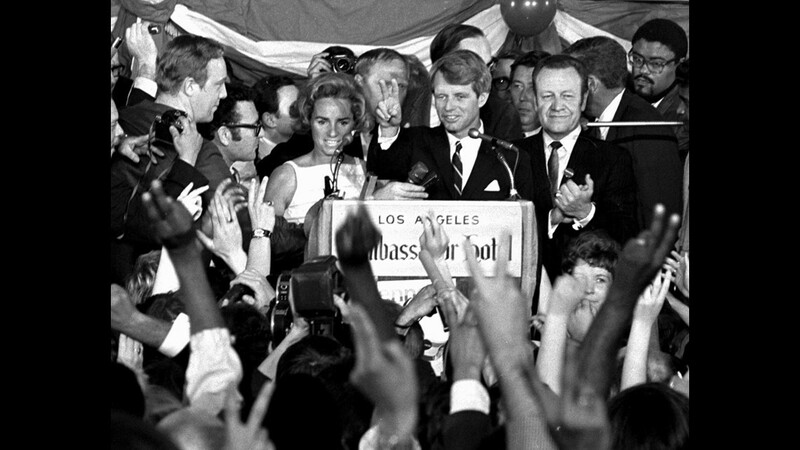 Sen. Robert F. Kennedy speaks his final words to supporters at the Ambassador Hotel in Los Angeles, moments before he was shot on June 5, 1968. At his side are his wife, Ethel, left, and his California campaign manager, Jesse Unruh, right. Football player Roosevelt Grier is at right rear. Sirhan Sirhan, right, the suspect of shooting Sen. Robert F. Kennedy is seen in June 1968 with his attorney Russell E. Parsons in Los Angeles. 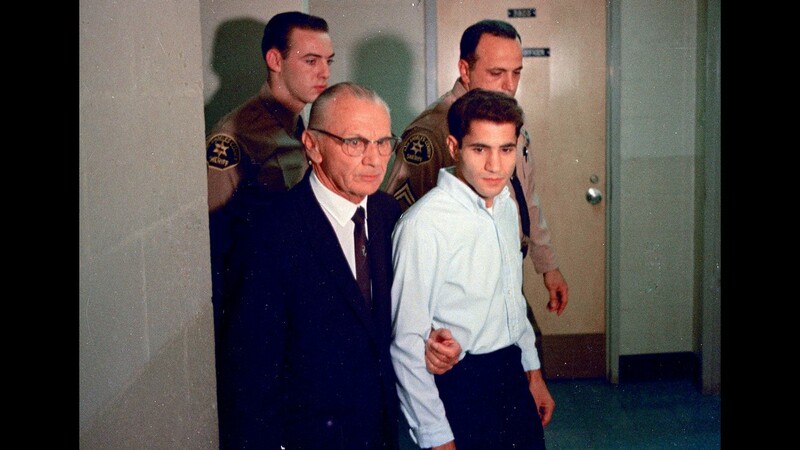 Sirhan Sirhan was convicted of killing Robert F. Kennedy. 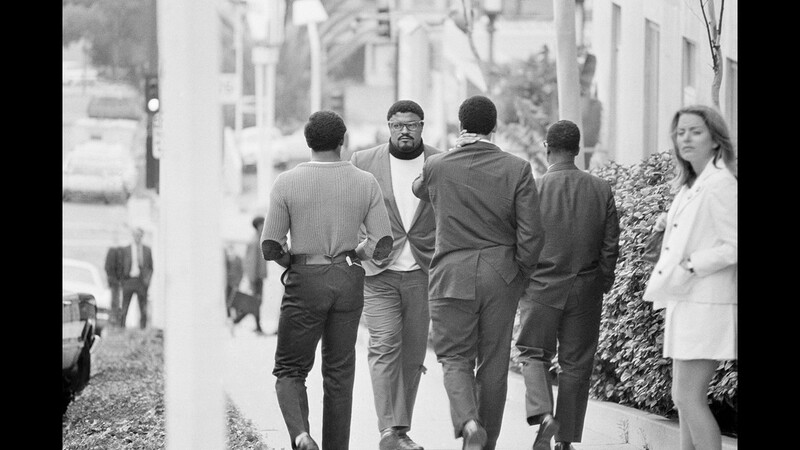 Football player Roosevelt Grier, credited with assisting in the capture of Sirhan Sirhan after the shooting early June 5, 1968 of Sen. Robert Kennedy, takes a few steps backwards as he and companions leave the hospital in Los Angeles where Kennedy has undergone surgery. Rafer Johnson, the Olympic decathlon champ, and Grier both were credited for helping capture and hold the suspect. 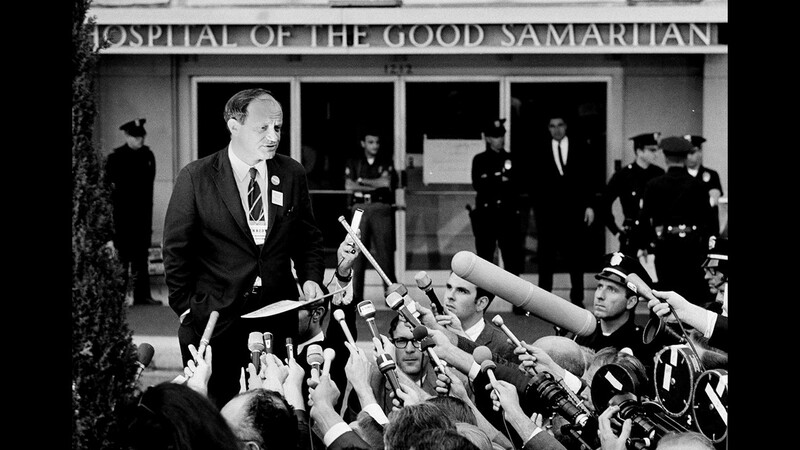 Frank Mankiewicz, Sen. Robert F. Kennedy's press secretary, tells a news conference outside Good Samaritan hospital in Los Angeles on June 5, 1968, that Kennedy emerged from three hours of surgery in "extremely critical condition." 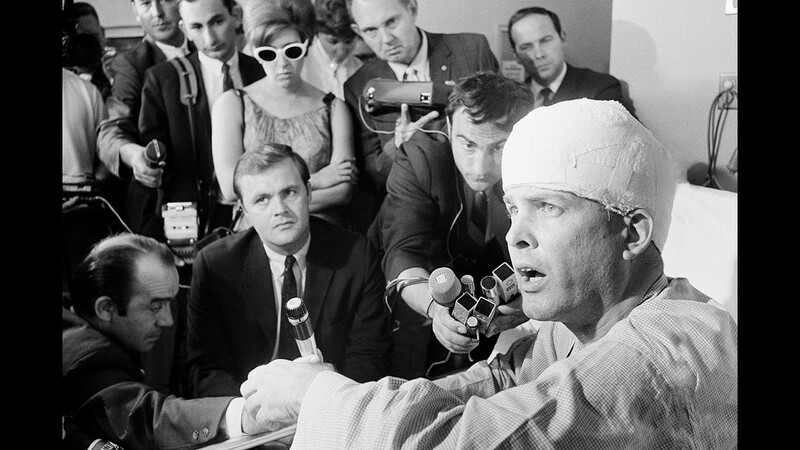 Paul Schrade, who was hit by one of the bullets fired by Sen. Robert Kennedy's assailant, holds a news conference in his room at Kaiser Hospital in Los Angeles on June 10, 1968. 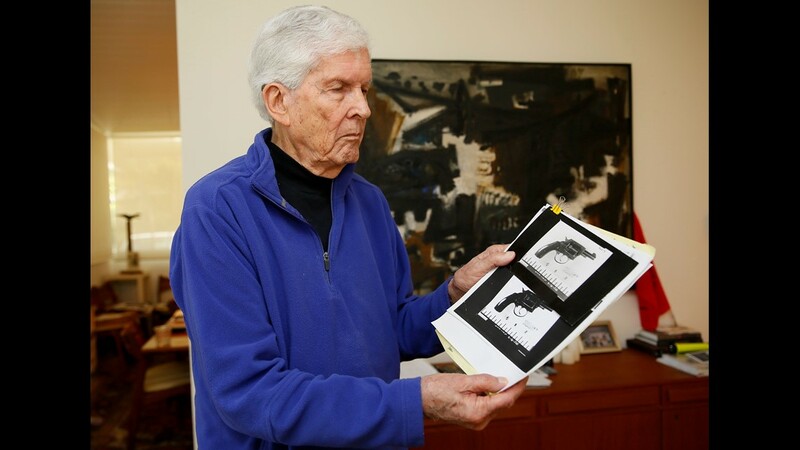 A half-century since that tragic morning, Schrade has fought the Los Angeles Police Department to reopen the assassination case over a theory that a second gunman was involved. 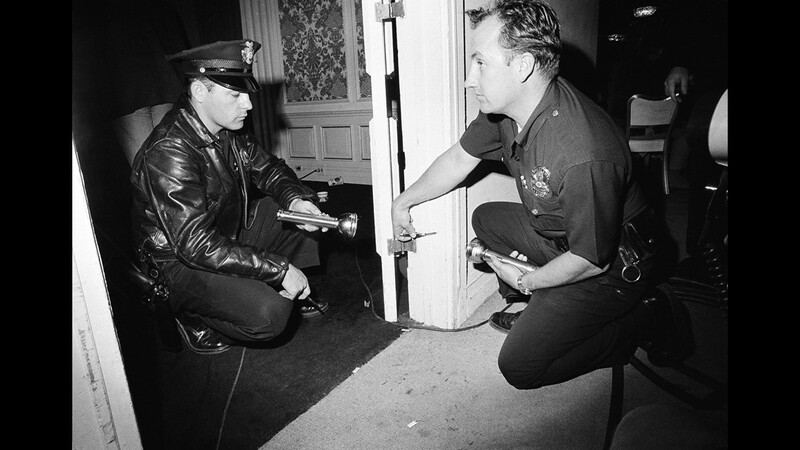 Robert Rozzi, police technician, and Charles Wright, police officer, left, inspect a bullet hole discovered in a door frame in a kitchen corridor of the Ambassador hotel in Los Angeles near where Sen. Robert F. Kennedy was shot and critically wound June 5, 1968. 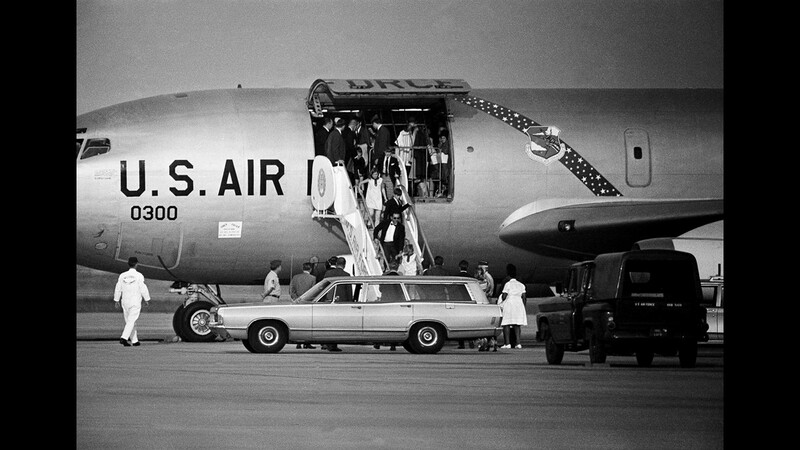 Children of Sen. and Mrs. Robert F. Kennedy arrive, June 5, 1968 at Andrews Air Force Base, Md. near Washington, after an evening flight from Los Angeles where their father was shot earlier in the day. Coming down ramp of an Air Force plane are, from bottom, Kerry, 8 assisted by an unidentified aide; Michael, 10, Courtnay, 11, and David, 13. Others inside plane include Astronaut John Glenn, back to camera, assisting Christopher, 4. 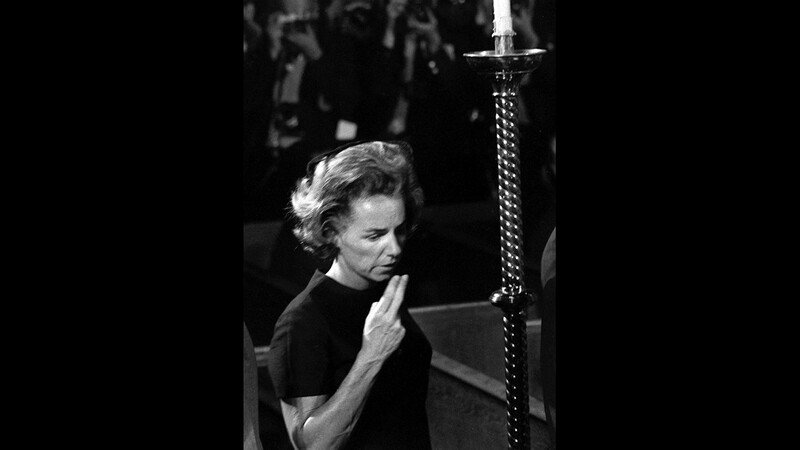 Ethel Kennedy blows a kiss at the casket of her late husband, Sen. Robert F. Kennedy, at the wake in St. Patrick's Cathedral in New York on June 7, 1968. 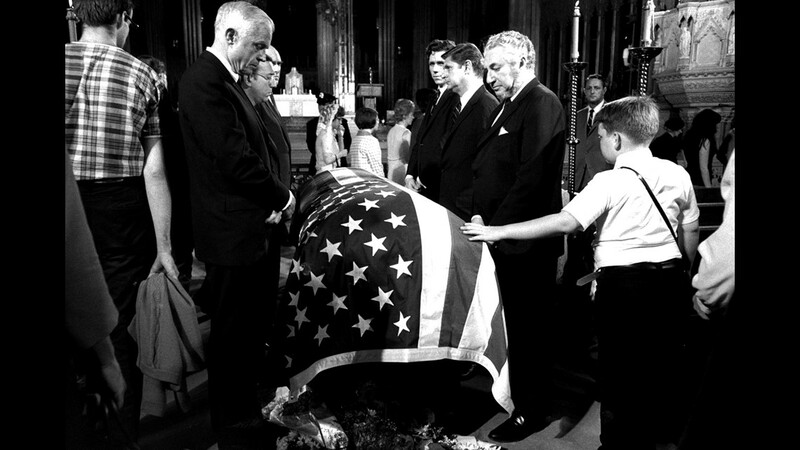 A young boy touches the casket of Senator Robert F. Kennedy in paying respects June 7, 1968 near the main altar in New York's St. Patrick's Cathedral. An honor guard stands around the flag-draped casket of the Senator. The flag was placed by the Green Berets, members of the U.S. Special Forces. 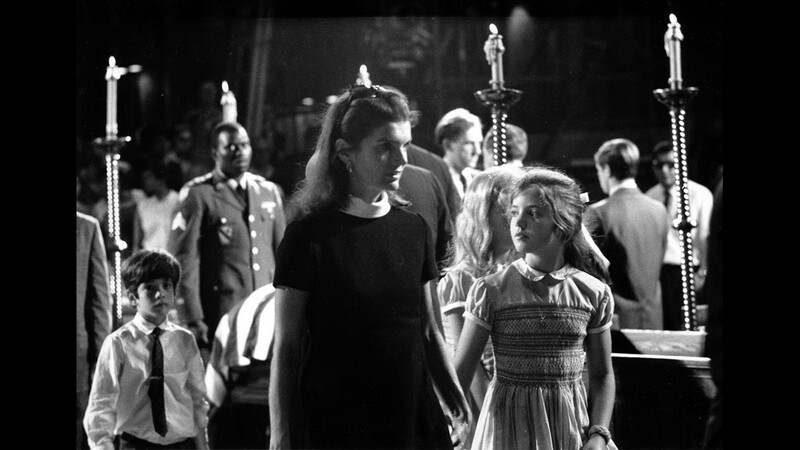 Mrs. Jacqueline Kennedy is seen with her children Caroline, right, and John Jr., behind, as they walk past the casket of her late husband's brother, Sen. Robert F. Kennedy, at St. Patrick's Cathedral in New York on June 7, 1968. 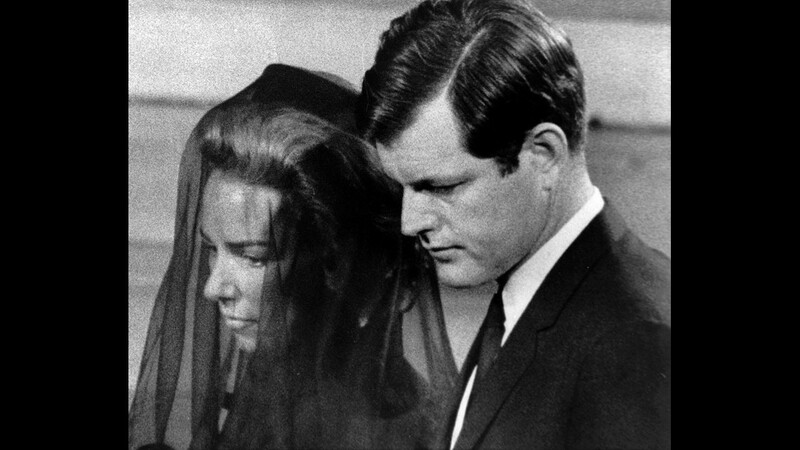 Mrs. Ethel Kennedy is escorted by her brother-in-law, Senator Edward Kennedy, to their pew in St. Patrick's Cathedral in New York for the funeral services of Senator Robert F. Kennedy, the morning of June 8, 1968. Pall bearers stand over the casket of assassinated New York Senator Robert F. Kennedy in St. Patrick's Cathedral in New York, June 8, 1968. 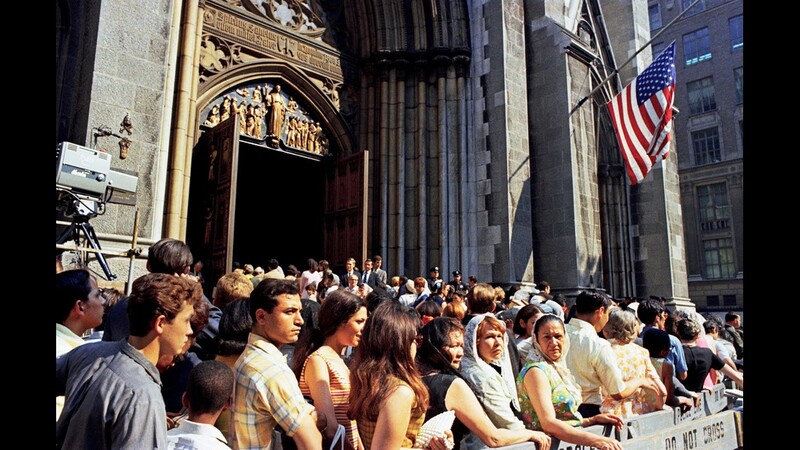 Mourners stand outside of St. Patrick's Cathedral in New York on the day of the funeral for assassinated Sen. Robert F. Kennedy, June 8, 1968. 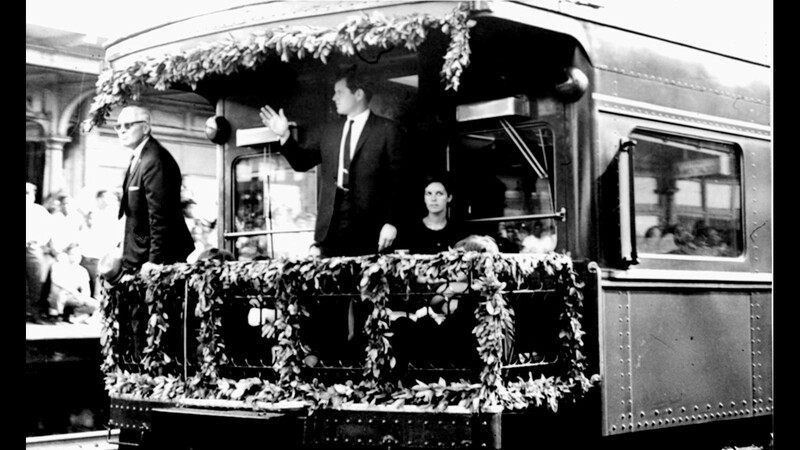 Sen. Edward M. Kennedy waves from the rear platform of the observation car bearing the remains of his slain brother, Sen. Robert F. Kennedy, as the funeral train passed through North Philadelphia Station, June 8, 1968. 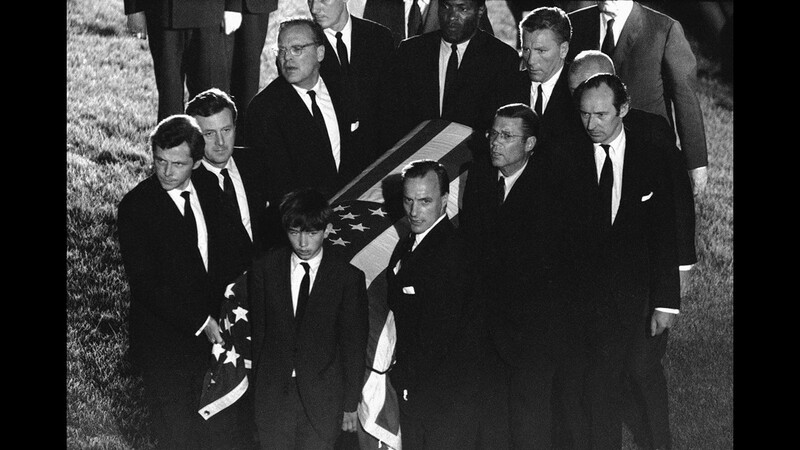 The casket of Robert F. Kennedy is carried to the grave site at Arlington National Cemetery, June 8, 1968. 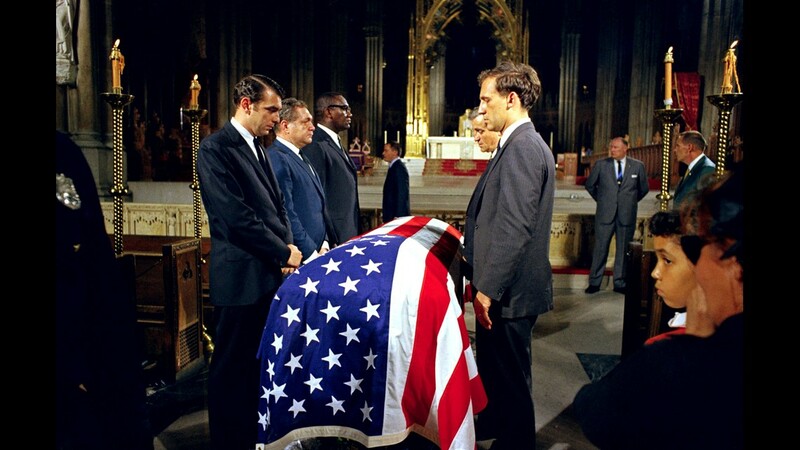 The pallbearers are led by Kennedy's oldest son, Joseph. 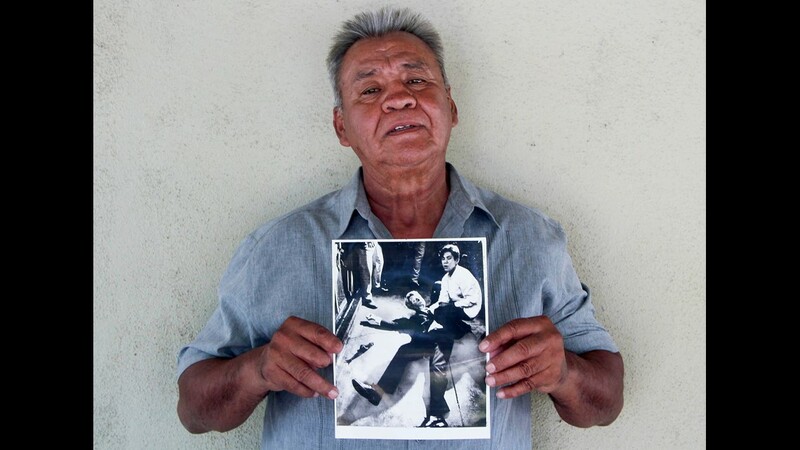 In this undated photo provided by StoryCorps, Juan Romero, 67, holds a photo of himself and the dying Sen. Robert F. Kennedy at the Ambassador Hotel in Los Angeles, taken by the Los Angeles Times' Boris Yaro on June 5, 1968, at his home in Modesto, Calif.
Sen. Robert Kennedy aide Paul Schrade holds an evidence photo of gunman Sirhan Sirhan's revolver at his home in Los Angeles on May 31, 2018. When a gunman open fire toward Sen. Robert Kennedy, the first bullet missed the senator and struck Kennedy aide Paul Schrade in the head. Schrade woke up the next day and found out the Democratic presidential candidate was dead. Today, Schrade believes the Los Angeles Police botched the case and failed to investigate possible leads about a second gunman. 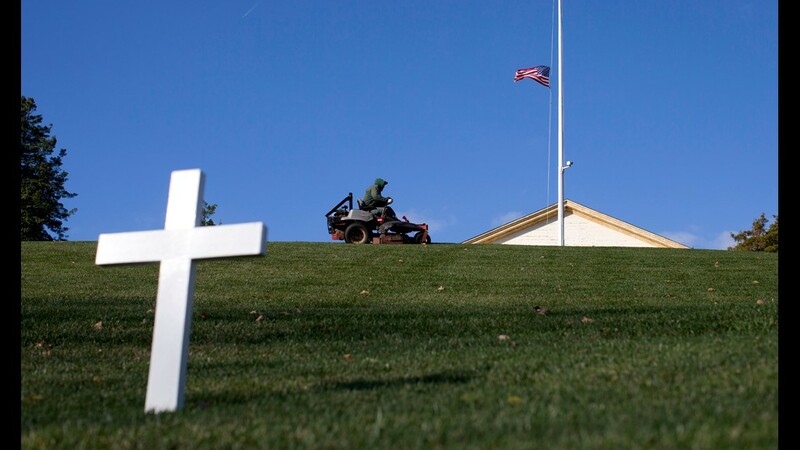 A cross marks the grave of Robert F. Kennedy as a groundskeeper mows the grass on Nov. 19, 2013 near the Arlington House, right, at Arlington National Cemetery in Arlington, Va.